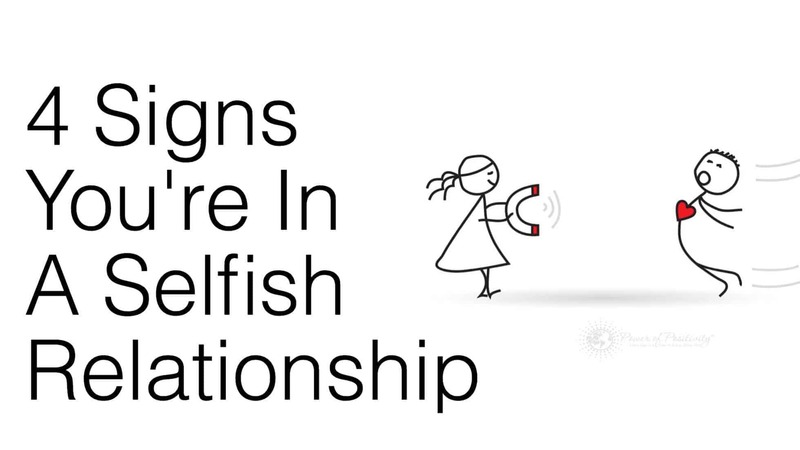 Nothing makes a relationship more imbalanced than selfish behavior. We all can, and will, be selfish at some point in our lives, especially when we want something badly. However, if being selfish is a constant occurrence in your relationship, it’s probably time to take notice and make a decision. There must be a state of equivalence that assures harmony in our loving relationships. There is a point when you need to stand back and ask yourself, “Is this self-love and preservation, or just plain selfishness controlling this relationship? 1. Your partner is always nagging and belittling you. There is a difference between someone pushing and pulling you to reach your goals with a cheerleader personality, and another making you feel worthless. A selfish person will never take your needs into consideration. They will do anything possible to make you feel worthless so that things are always about them. The focus can only be on what they are accomplishing. If you find yourself giving and never receiving this is the imbalance of a selfish relationship. Psychologist Daniel Goleman, author of Emotional Intelligence, writes: “Self-absorption in all its forms kills empathy, let alone compassion. When we focus on ourselves, our world contracts as our problems and preoccupations loom large. But when we focus on others, our world expands. Our own problems drift to the periphery of the mind and so seem smaller, and we increase our capacity for connection – or compassionate action.” A relationship that is one-sided cannot flourish. 2. Your partner believes that what he or she does is more important. Selfish people do not waste their energies considering the needs of another, even those of a life partner. They want what they want and believe that they have the right to put themselves first. There is a difference between self-love and being selfish. This behavior is a form of betrayal. If you don’t stand up for what you want your partner doesn’t feel the need or desire to stand up for what you desire either. You must show your worthiness and love in order to combat any selfish behavior in a relationship. A selfish behavior that is repetitively present is emotionally draining and toxic. It’s unhealthy. You begin to put yourself second and eventually any respect will disappear from the relationship. 3. Your partner is competitive and insecure. 4. Your partner doesn’t apologize. This is a big one! If your partner can’t say “I am sorry” when they have done something offensive or hurtful, it’s a sign that they might suffer from a narcissistic disorder. Moral values do not exist in this psychological disorder. The narcissist doesn’t know resentment or wrongdoing. It’s all about them. You are not important enough to stop them from seeing their mistakes. One selfish soul in a relationship diminishes the ability to love fully with joy. If your partner is driven by an egotistical nature that never regrets anything, you have a selfish soul in your presence. No relationship is perfect, but when there is no consideration, respect or trust, it can become an abusive partnership. You are the only who can decipher if a little selfishness is good, or if it borders on narcissism. Self-love and self-worth exist in loving and healthy relationships.